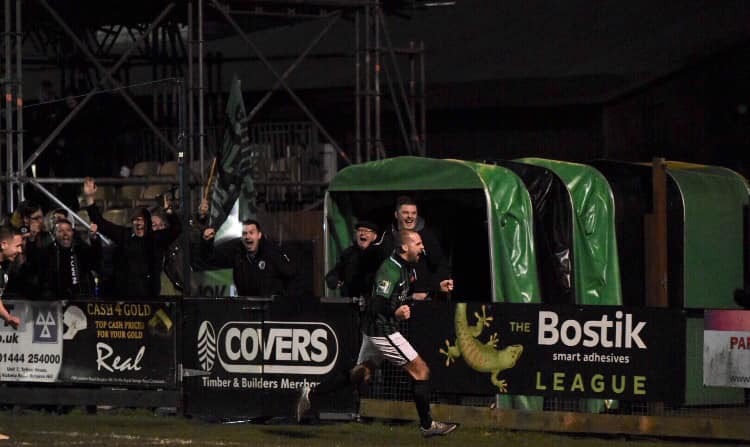 But Burgess Hill rode their considerable luck, and they invested it with interest into a hugely committed performance. Manager Simon Wormull is a good friend of the Borough but also a canny tactician, and he played to his strengths. Disrupt the opposition, take no risks, exploit your own team’s pace. Hill were robust and occasionally rough-edged, and on a bumpy pitch their direct style never allowed Borough to settle. Jamie Howell is currently like a tailor with no cloth. From a small squad, injuries had already side-lined Torres, Cox and Adebayo-Rowling, loan players Ljubicic and Jordan were ineligible, and youth players Andrew Briggs and Dan Blackmore lined up in midfield – both lads serving the cause admirably. And just after half-time, when Charlie Walker limped off with an ankle injury, Sports legend – and Under-23 coach – Matt Crabb came off the bench to roll back the years. More of the same in the second half? So far, genuine scoring chances had been as rare as green elephants. This was the sort of tie to be settled with a slip, a single scruffy goal, a sudden break. But it was all more clout than class, and any creativity – most of it from Borough – was swiftly kicked into touch in both senses. Hill midfielder Aiden Enver was cautioned for an alarming late challenge on the excellent Ransom, and was a little lucky to stay on the field for a second snapping foul soon afterwards. In the middle of the half the home side enjoyed their best spell, Enver manufacturing a foul and a 22-yard free-kick which Howes easily saved, and the tall and mobile figure of Aaron Smith-Joseph was proving a handful up front. The loss of Walker had drawn some of Borough’s sting, but the visitors steadily regained the upper hand and Briggs rattled the crossbar with a great strike after good work by Dawes. Then Tom Gardiner had a free header from a right-wing corner but only found the gloves of keeper Bromage. Into extra-time, then, and the Sports enjoyed a good spell of pressure but still failed to trouble the scorers. And on 112 minutes the Hillians finally broke through. Smith-Joseph’s stampeding run in from the left finished with a low shot, beaten out by Howes but only as far as Dan Beck, who drove the loose ball triumphantly into a welcoming net.